Why isn't there a garden robot? Watering: About the most we have today are drip watering systems with automatic timers. There aren't even commonly available systems that measure and react to the actual water content in the soil. Backyard Garden Automation: They can fly a camera on three winches over a football field, why can't we rig up a hose, seed and rabbit pellet dispenser, micro weed eater, and camera? How about a social web site that shows an overhead picture of your garden and invites people to play a "game" of nuking your weeds, complete with CGI explosions of the targets. The aggregate result, less protected areas where you know there are plants, can direct the robot to weed the area. https://hackaday.io/project/4197-reagent-robot Automate the Reagent (take a sample, put a drop of stuff in, shake, look at the color) testing of water for Aquaponics, Ponds, Aquariums. http://www.xs4all.nl/~sbolt/e-groeneVinger_Duim.html Hooking up a small solar powered pump to the "green thumb" results in automated, just-in-time, minimal water usage gardening! http://www.omegagarden.com/ Rotating gardens with the grow light in the center said to decrease growing time. http://queue.ieor.berkeley.edu/~goldberg/garden/Ars/ The "Telegarden" was a remote operation experiment over the internet. http://www.maireid.com/wickingbeds.html Wicking beds turn standard raised bed gardens into self watering, super low water use, huge earthboxes! Imagine a standard raised bed frame, then put a plastic or rubber liner inside, making a sort of pool. Next, put "agi-pipe" (used for building soil drains) along the bottom, connected to a plastic elbo and a stand pipe. Fill in a few inches of gravel or "screening rock" and cover with shade cloth or old sheets to keep the soil from invading the space between the rocks. At one end, cut a "drain hole" in the liner so the water can never rise above the rocks. Finally fill in soil, compost, and mulch as always. 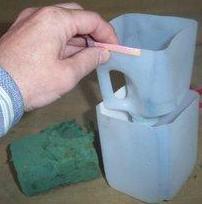 Fill with water from the stand pipe until it starts to seep from the drain hole. Now the bed will be watered for weeks on end, and no water will touch the surface, preventing oportunistic seeds from rooting and keeping the mulch and compost soft and easy to work. The water also will not seep into the soil below the bed, so much less water is used. 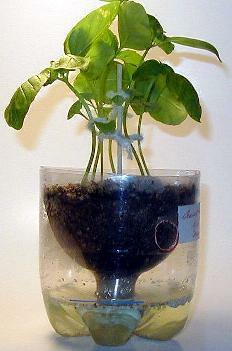 http://toppertwo.tripod.com/pop_bottle_pots.htm self watering containers made from empty soda bottles. http://www.instructables.com/ex/i/2C5C6F622F3E1029BC6B001143E7E506/?ALLSTEPS self watering containers made from empty half gallon plastic milk jugs. A tip to take into consideration though is to tape or paint the outsides opauqe to prevent algae growth and promote healthy root development.This is because algae like light and suffocates the roots by covering them and stealing nutrient etc. And the roots become stunted on some plants because they strive to avoid the light and by doing this they bunch up in the middle of the planter. We made these from old laundry soap jugs (the really big ones) and sent kids home from RE classes with tomato plants. The handle is a perfect place to shove a small, dead bush for a latice. The kids don't have to remember to water them more than once a week or so.